14 million blogs were added since July 2011 (as of 12/2/2011). If people are adding nearly 3 million blogs per month, surely this is a tool worth understanding and maximizing. That is the conclusion Technorati reached in their 2011 State of the Blogosphere Report. 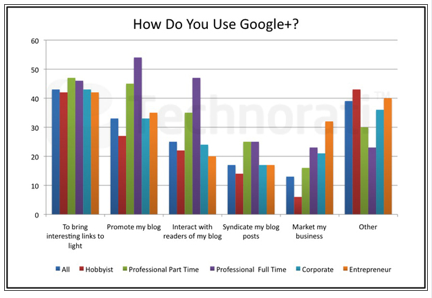 Hobbyist—Someone who blogs for fun and doesn’t report any income from blogging (this represents 60% of the study). 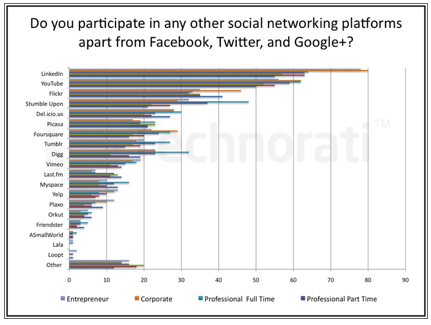 Professional Part-time—These people typically blog to supplement their income and blog about personal musings or technology (approximately 9% of respondents). Professional Full–time—These individuals make their living by blogging, but typically work freelance (approximately 9% of respondents). Corporate—Corporate bloggers blog full-time as part of their job or are contracted to blog full-time for a company (8% of respondents). Entrepreneur—Entrepreneurs blog for a company or organization they own (13% of respondents). 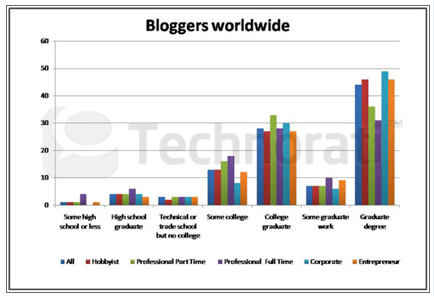 ***Please note that Technorati’s data is heavily skewed by the presence of 60% hobbyist bloggers—people who blog as a way to express themselves or influence their community, but don’t seek to make money. I will focus on results from the 40% of bloggers who have a business objective with their blogging. 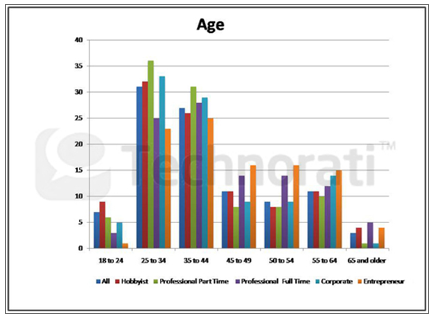 Nearly 60% of bloggers are between the ages of 25 and 44. Most business bloggers are ages 25-44, but nearly 50% of entrepreneurs are over 45. Most bloggers are highly educated, with almost 30% having college degrees and an additional 50% who have started or completed a graduate degree. Most bloggers have been blogging for at least 2 years. A vast majority of bloggers has at least 2 years of blogging experience, with a significant 20% carrying 6 years or more experience. The average number of blogs managed by each respondent is three, up from two in 2010.
Business bloggers now manage three blogs on average. 40% of bloggers spend more than 3 hours a week working on their blog. 60% of entrepreneurs spend 1 to 5 hours blogging weekly. 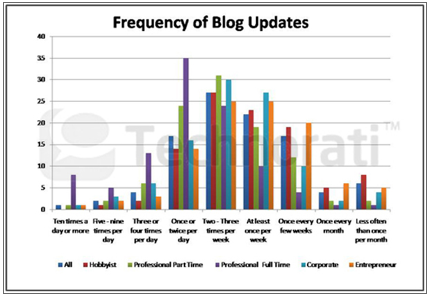 A majority of bloggers updates their blog at least two to three times per week. Over 50% of bloggers post at least two to three times per week. A majority of bloggers have been at this for at least 2 years. So, if you haven’t started, why not start now? See this article by Marcus Sheridan for some reasons to get started. Technorati found that a surprising one-third of bloggers have work experience in traditional media as journalists and in other capacities. They also found that consumers are increasingly putting their trust in blogs versus traditional media. This reflects a major shift in marketing for brands of all sizes. Brands must become friendly with bloggers. If 40% of all blogs are business-oriented, that means there are around 72 million business blogs. Many of these represent an opportunity for you to foster mutually beneficial relationships with bloggers. Not convinced? Check this out: 65% of bloggers follow brands on social media and most bloggers write regularly about the brands they follow. 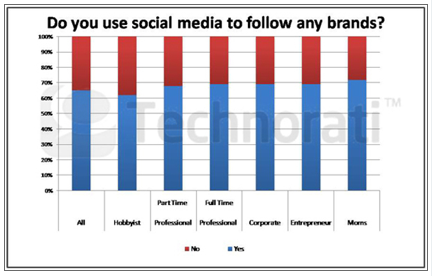 A significant majority of bloggers uses social media to follow brands. A vast majority of bloggers blogs regularly about the brands they follow. 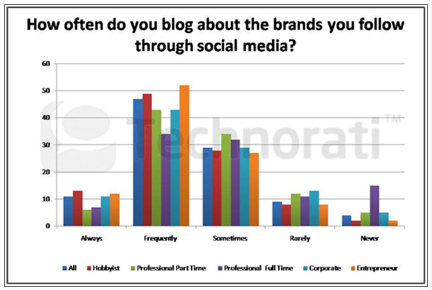 Do you know the bloggers who follow your brand? Are you connecting with them? What are they saying about your business? How can you help them achieve their goals while helping spread the word about your products, services and special offers? Have you considered developing a brand advocacy program with some of these bloggers? As expected, consumers receive their information primarily through friends, whether in real life or on social media. 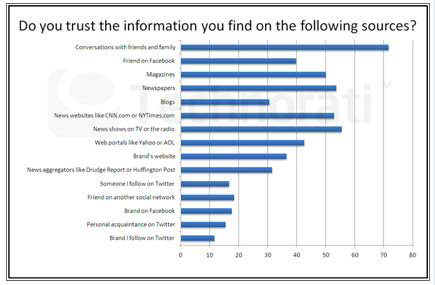 Of all social media platforms, consumers trust information they receive through blogs more than Facebook or Twitter. Consumers are almost as likely to look to blogs for information as they are magazines and newspapers. Consumers have the lowest level of trust in a brand's social media sites. 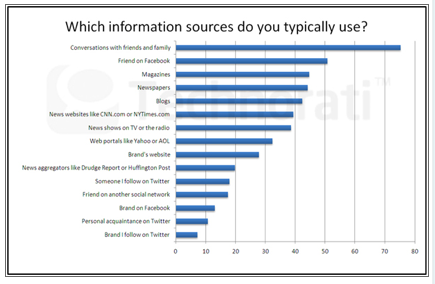 Consumers are almost as likely to share information they find on a blog as from a newspaper or magazine. 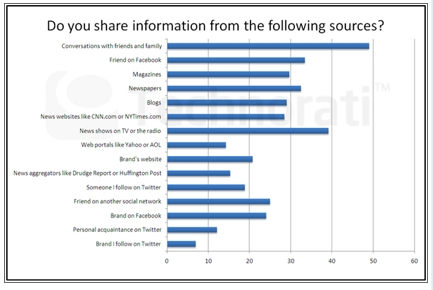 Consumers are most likely to share information they find on blogs through email and Facebook with Twitter being the third most likely. 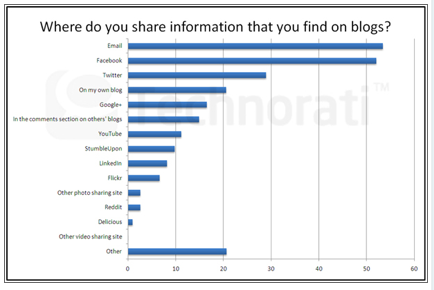 Email and Facebook are the most likely way consumers will share blog posts. Are you making it easy for your followers to share your posts? Are you focused on becoming a trustworthy resource for your fans? Because blog posts have a longer shelf life than Facebook or Twitter, are you spending adequate time creating content worth viewing in 6 months or 2 years? Bloggers get their inspiration and insights from social media. 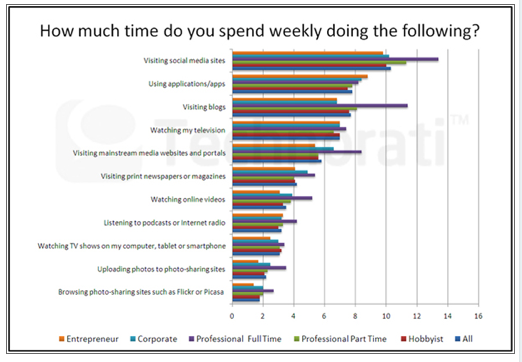 Bloggers spend 10-12 hours weekly on social media sites, with 14% spending at least 21 hours. 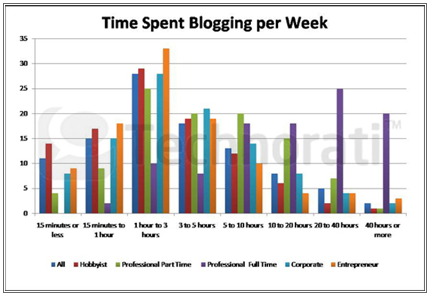 Additionally, bloggers spend another 8 hours weekly reading other blogs. Most bloggers spend at least 10 hours a week on social media sites. Over 90% of bloggers use Facebook and at least 65% of non-corporate professional bloggers have a Facebook page for their blog. The primary way bloggers use Facebook is to promote their blog, but a significant 61% of entrepreneurs also use Facebook to market their business. 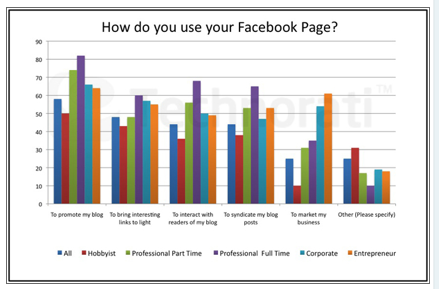 Entrepreneurs are nearly as likely to use Facebook to market their business as they are to promote their blog. Twitter is very important for bloggers. 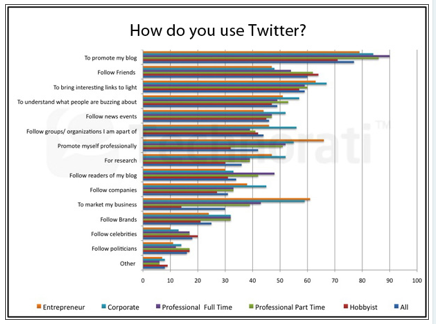 Over 80% of bloggers use Twitter and all professional bloggers have at least 1000 followers. All business bloggers have 1000 Twitter followers on average. 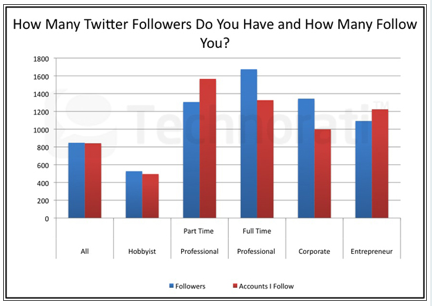 Note that full-time professionals and corporate bloggers have more followers than accounts they follow. Around 80% of bloggers use Twitter to promote their blog. The most common use of Twitter is to promote a blog. Bloggers are early adopters of Google+. This is one of the first studies I’ve seen on Google+ adoption. Over 60% of all surveyed bloggers have a Google+ account, but few had established a page. Bloggers use Google+ for bringing interesting links to light, even more than promoting their own blog. Bloggers have a diverse social media toolkit. Not surprisingly, LinkedIn and YouTube are the top social media platforms used by bloggers. At least 30% of professional bloggers also make use of StumbleUpon, Delicious and Digg. LinkedIn is the most commonly used social networking platform for business bloggers after Facebook, Twitter and Google+. The most effective social tools for driving traffic are Facebook and Twitter, with LinkedIn being a distant third. 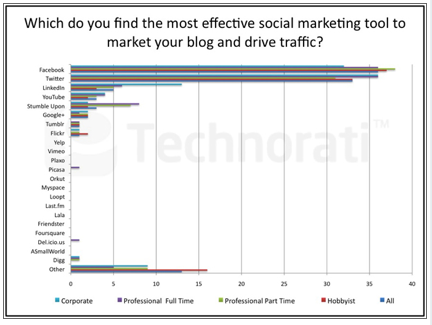 Facebook and Twitter lead the pack in effectiveness for driving traffic to blogs. Many pro bloggers have at least 1000 followers on Twitter. Here are 17 tips from social media pros on how to maximize your Twitter marketing. Around 90% of bloggers use some form of media in their posts, with photos being the most popular. 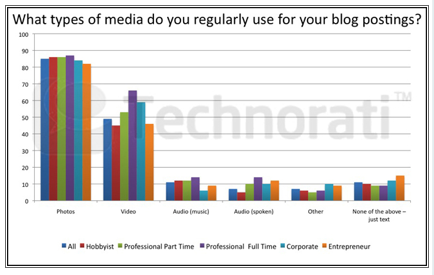 Videos are also widely used by almost 50% of all bloggers. Photos are the most popular media type. Notice how audio is much less utilized. While only 14% of bloggers earn a salary through blogging, bloggers are increasingly finding ways to earn money through advertising and brand partnerships. If you’re interested in knowing how bloggers approach revenue and advertising, see these interesting results. 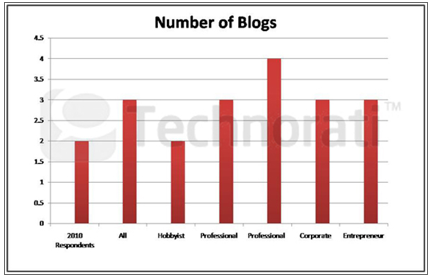 Professional bloggers are generally increasing their blogging activity since they started blogging. 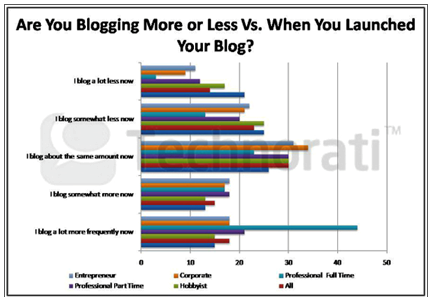 Professional full-time bloggers are significantly increasing their blogging activities. How about you? Do your 2012 business plans include blogging? Leave your questions and comments in the box below.